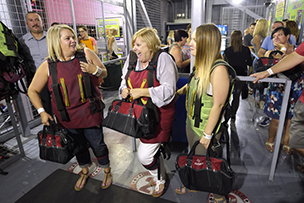 SlotZilla, the zip line attraction at Fremont Street Experience in Las Vegas, celebrated its “Month of the Millionth Rider” on Sept. 28. The celebration awarded ten random participants $1,000, and there was one grand prize winner, Pamella Siegel, who received $1,000, free rides for a year, and a commemorative plaque from Las Vegas Mayor Carolyn G. Goodman and Patrick Hughes, CEO and president of Fremont Street Experience. Appropriately, Siegel was in Las Vegas to celebrate her 65th birthday with her daughter and granddaughter. SlotZilla has two different levels: the lower “Zipline,” which starts 77 feet up and sends riders in a seated harness down an 850-foot cable; and the upper “Zoomline,” which launches riders “superhero-style” from 114 feet up down a 1,700-foot zip line. Both lines travel directly above the bustling Fremont Street Experience.